Some of the fastest sports cars in the world, whether on road or track, are made by Donkervoort in the Netherlands. Joop Donkervoort began building Lotus Super Seven inspired cars in a shed in Tienhoven in 1978. Established as Donkervoort Automobielen B.V., the company shifted its premises to Loosdrecht several years later, before it’s last move to Lelystad, where it has a modern plant located beside the highway A6. Further expansion occurred in 2014, with the opening of a facility at the Bilster Berg Drive Resort in Germany. Mid Januari a new Sales & Service outlet will be opened on an other location in Germany. English Lotus Seven sports car can rightly be considered a legend. 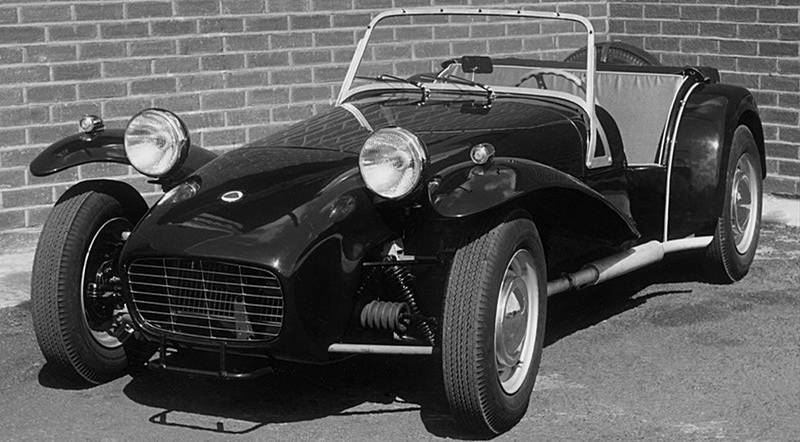 Built by the legendary Colin Chapman, the nimble roadster is considered the epitome of the Lotus philosophy of the low curb weight and simplicity. For the first time Lotus Seven was presented to the public in 1957 and pozitsionirirovalsya as a cheap sports car for use in club racing. Most of the cars sold as an assembly kit that happy owner collected in his garage. Interesting fact: this set is not taxable if it is not applied to the assembly instructions, so the car was attached instructions for dismantling, which is necessary to read the last page. Donkervoort cars are built by hand, ultra lightweight and contain high-tech carbon fiber components. The cars are noted for their tremendous sleekness, long hood, and low profile. Donkervoort used European Ford engines to power its autos up until 1999, when a switch to Audi power-plants was made. 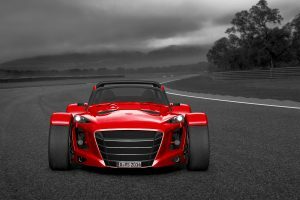 Donkervoort’s slogan, “No Compromise,” is a reference to the back-to-basics philosophy of driving without assistance systems such as power steering and anti-lock brakes. When you drive a Donkervoort, rather than being somewhat detached from the vehicle by corrective computer systems, you are connected to and feel the car, and how it responds to the road. Donkervoort buyers even go through driving courses to learn how to handle their new cars in various conditions, such as on wet roads. Produced in limited numbers, Donkervoort cars are intended for true motoring enthusiasts. You can order a Donkervoort in almost any body color and interior finish. Whether you want the dashboard in aluminum or carbon fiber, or the seats in Alcantara or leather, or a suspension suited to touring or racing, Donkervoort will tailor the car to suit you. The cars displayed in Donkervoort’s modern showroom in Lelystad can be seen by motorists driving by on the A6. This building also houses the executive offices, the production & sales planning departments, management, and the design studio. Attached are the manufacturing area, warehouse, racing and carbon fiber engineering departments. Denis Donkervoort manages the company supported by founder Joop Donkervoort, which has no outside investors and employs about 30 people. The Donkervoort Cup was a racing event held in The Netherlands, Germany, Belgium and elsewhere from 1993 to 2001. This competition allowed private owners of Donkervoort cars to compete, while receiving professional mechanical and technical support. Participants also enjoyed the catering and hospitality which were provided. Joop Donkervoort’s first car was the S7 (Super Seven). It was fitted with a 1.6-litre Ford Crossflow 90 horsepower engine, a four-speed transmission, and could go to 106 mph. The rear axle came from a Ford, while the front suspension was comprised of Triumph parts. 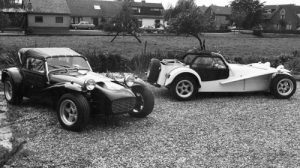 However, the S7 didn’t meet type approval for operation on Dutch roads, so Donkervoort set about making modifications which led to the next model, the S8 (Super Eight). The S8, introduced in 1983, had a 2-litre engine with up to 110 hp, and a five-speed gearbox. Both the S7 and S8 had dual aluminum fuel tanks, and a double braking system. Donkervoort produced about 140 S7 and S8 cars from its premises in Tienhoven. 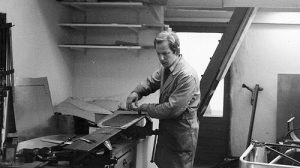 After Donkervoort moved to Loosdrecht in 1983, the company began development of the S8A, which appeared in 1985. This model had a widened chassis, fuel injection, and independent rear wheel suspension. The fenders and nose were also redesigned, and its 2-litre Ford engine produced 117 hp. The S8 and S8A had the same overall dimensions as did the S7, but were Dutch-street-legal. Donkervoort later offered a turbocharged variation, the S8AT. Using the S8A 2-litre engine, the turbocharger brought the engine output to 170 hp. The chassis was widened again, and stiffened. There was also a 2.2-litre version, which provided 190 hp. For the company’s tenth anniversary in 1988, Donkervoort brought out the D10. Introduced at the Paris Auto Show, its minimalist design, which evokes that of racing cars of the 1930s, was without windshield or spare wheel. Its turbocharged 2160 cc engine produced 190 hp, and some very late models circa 1994 had a 280 hp Cosworth engine. Due to its open cockpit configuration, Donkervoort included a matching driving helmet with the purchase of the car! Only 10 D10 examples were made. In 1989, on a temporarily closed section of motorway, a D10 went from 0 to 100 km/h (62 mph) in 4.85 seconds, breaking the world acceleration record for a production car. The D8 Zetec Classic succeeded the S8AT in 1993. It was fitted with the then-new 1.8-litre Ford Zetec 140 hp engine. Donkervoort added the D8 Zetec Sport model in 1994. Construction of this car made extensive use of carbon fiber materials. The sport model was given a modernized nose and grille, a curved windshield, and a 2-litre engine producing 160 hp. The D8 Cosworth, presented in 1994, had a 2-litre Ford Cosworth turbo engine of 220 to 280 hp. It could go to 146 mph, and do 0 to 100 km/h in 4.8 to 4.1 seconds. The D8 Cosworth Classic had standard fenders, while the Sport version had bicycle type fenders which fit closely over the tires. The 1999 D8 Audi (AGU) had a turbocharged 1.8-litre Audi motor which produced from 150 to 245 hp. The Audi engine was lighter and more compact than the Ford power-plant, and easily met the emission standards of the time. Donkervoort began using the Audi 1.8-litre 20V E-Gas (electronic throttle) engine in 2003 for the D8, which produced from 150 to 270 hp. At a weight of only 630 kg, the D8 could go from 0 to 100 km/h in 5.2 to 3.8 seconds, depending on engine type. The Donkervoort J25 was a prototype car meant to mark the company’s 25th anniversary. Taking some design cues from the D20, the code-named J25 was given small doors and a new nose, and it was the first Donkervoort car to sport 270 hp. The limited edition D8 270 RS was introduced in 2005. It was based on the D8 RS, which broke lap records in 2004 and 2005 at Nürburgring. Twenty- five examples of this model were made. The D8 270 RS, with the turbocharged 1.8-litre 270 hp Audi motor, could go from 0 to 100 km/h in 3.6 seconds, and from 100 km/h to 0 in 2.4 seconds. The D8 GT, which premiered in 2007 at the Geneva Motor Show, was the first Donkervoort with an enclosed cabin. It was fitted with a turbocharged 1.8-litre 270 hp Audi engine. With much of the car made of carbon fiber, this model at 650 kg was the world’s lightest GT car. The GT has a wider track and larger brakes (designed by Tarox of Italy) than does the standard D8, and it rides on custom 17- inch aluminum wheels (made by Rays Engineering of Japan). A D8 GT took second place in the FIA GT4 European Cup. A D8 GT also raced in the 2011 24H Dubai, and won first place in the SP3-GT4 class. Presented in 2008 was the D8 270, which succeeded the D8 270 RS. Again powered by the Audi 1.8-litre engine, it had a newly shaped grille and nose cone, and could go 0 to 100 km/h in 3.6 seconds. 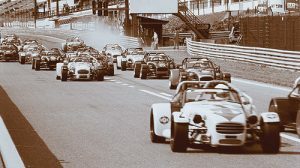 As of 2011, the D8 270 was one of the fastest cars on the Nürburgring Nordschleife, with a time of 7 minutes, 14.9 seconds. The D8 GTO, the prototype of which was unveiled at the end of 2011, had a 2.5-litre 5-cylinder turbocharged Audi engine with up to 400 hp. With its entire body made of carbon fiber, the GTO weighs less than 700 kg. It can go 0 to 100 km/h in 2.8 seconds. The D8 Premium GTO was produced in a limited edition of 25 in 2013. The standard D8 GTO, offered in both Performance and Touring models, began production in 2014. A Donkervoort D8 GTO broke a speed record in September 2014 at the Bilster Berg Drive Resort, completing a lap in 1 minute 46.12 seconds. This was a record for a street-legal production car. Donkervoort offered its Bilster Berg Edition, based on the record-breaking 2014 test car, in a limited edition of 14 examples. With refined chassis and handling, the Bilster Berg Edition has a dark nose section made out of carbon fiber. 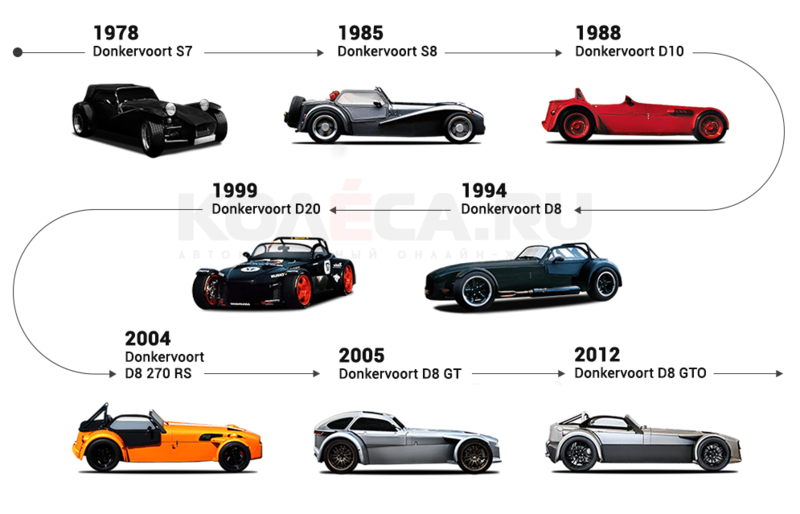 Donkervoort’s present lineup of cars, all of them new for 2016, comprises of three versions of the D8 GTO. The D8 GTO S (Sport) is a luxury tourer, providing extra comfort for driver and passenger whether on city streets or on Europe’s mountain roads. The D8 GTO RS is the latest incarnation of the RS, and is the ultimate variation of the D8 GTO. Production of this model is restricted to 40 units. The D8 GTO R (Race), which Donkervoort calls a “thoroughbred circuit monster,” is a racing car for use on the track only, and is not street-legal. The prices of the current models are between 150.000 and 250.000 Euro. Here is the model overview.